Hey gang, it’s time for Craft Lightning – Dr. Seuss edition once again! Craft Lightning is hosted by The Country Chic Cottage, 30 Minute Crafts, and Mom Endeavors. Craft Lightning projects are ones that you can make in under 15 minutes (minus drying time). The one I have for you today is so darn simple that quite frankly, I can’t even really write up a full step by step tutorial for it. That’s how easy it is! 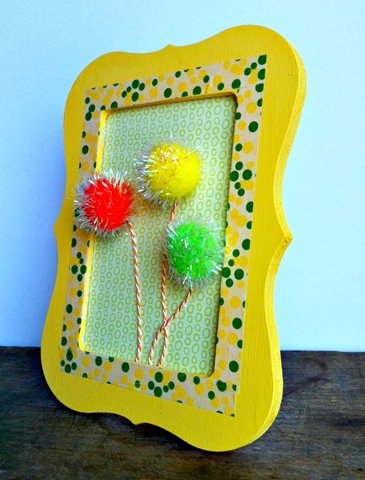 For my Dr. Seuss Framed Truffula Trees, all you’ll need is: a wooden frame (mine came from the dollar section at Michaels), a few pompoms (I like the glittery shimmery ones for even more of that Dr. Seuss-like effect), acrylic craft paint, washi tape (mine is from Elmer’s), some baker’s twine, a small piece of scrapbooking paper to fit your frame, glue (I”m using Aleene’s Tacky Glue), a paintbrush, and a pair of scissors. You might need some sandpaper if the edges of your frame are rough. Ok, now seriously, this is so simple. Sand your frame if needed and make sure to wipe away all the dust. Paint the frame. 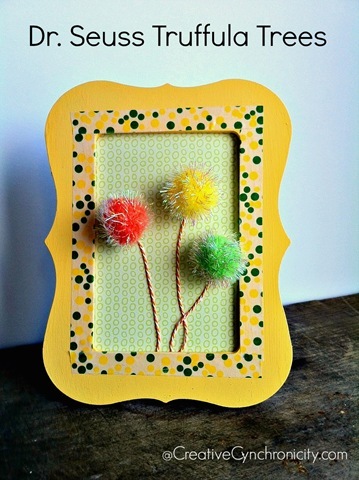 While it’s drying, cut and glue the piece of scrapbooking paper to the backing piece of the frame. 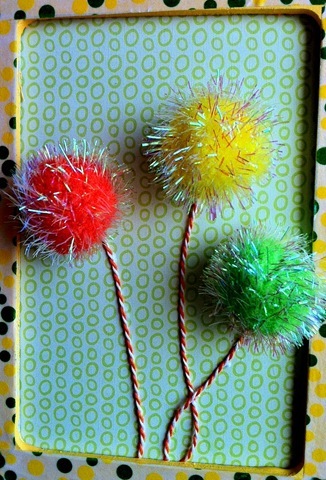 Glue on some baker’s twine stems/tree trunks and then the pompoms for the tops of the truffula trees. Ta da!!! Once the paint is dry, assemble and display. It would be lots of fun in a kid’s room or as a party decoration. Be sure to check out all of the posts in the Craft Lightning Dr. Seuss edition by clicking on the image below– participants have been posting them all week so there’s a bunch of fantastic ideas there! Those trees are adorable! I am a huge Dr. Seuss fan! OMG! This is the cutest idea ever! Pinning this to do with my kids, we love Dr Seuss EVERYTHING! Natalie recently posted…DishDish is a must-have for recipes! I love this so much Cyn!! Great job! This is too cute! Thanks for sharing on Show Me Saturday!